The charts here provide that info. They represent the imperfect result of many hours of phone and email communication with 17 different people over the course of more than a month. Even so, the numbers are rough, complicated and require explanation. Income numbers here do not include rental income, investment income or income from foundations. For the most part, they also do not include large bequests that could skew the numbers for a given year. And they do not include camps. 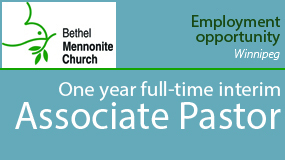 There are also “pass through” donations to Mennonite World Conference and Anabaptist Mennonite Biblical Seminary, among others, which may or may not be included, depending on the church body. The various church offices do not record income in the same way, making apples-to-apples comparisons tricky. Plus, accounting gets tangled and is not always governed by common sense. At least there is talk of standardizing financial reporting among the offices in the future. 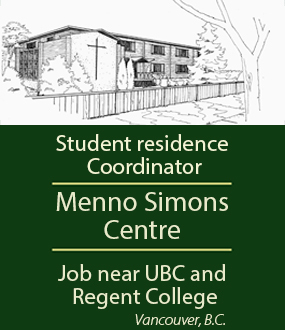 Canadian Mennonite’s main goal was to gauge the financial commitment of congregations and individuals to denominational offices over time. So consider the numbers a general indication of that. Hopefully they also serve as a sort of baseline that will allow for comparisons of pre- and post-Future Directions decisions. That said, part of the story here is that it is all so complicated, non-standardized and caveat-laden that readers should be careful not to read too much into the figures. Still, numbers provide some useful sense of the broader picture. That picture is one of gradual decline. 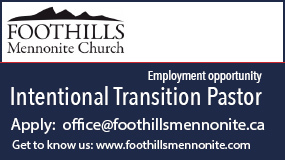 A decade back, congregations and individuals gave $7.1 million, combined, to area and national church offices. Last year, that was down to $5.3 million, and estimates for this year are $5 million. 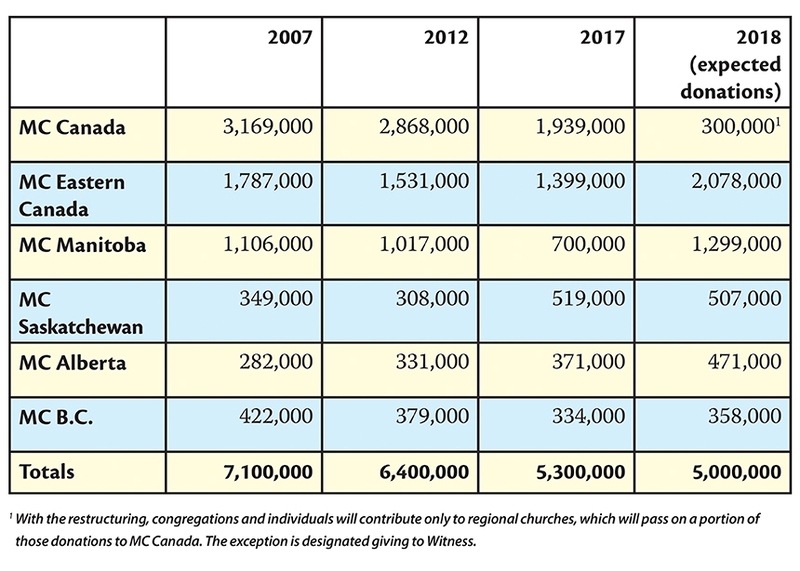 Note that the increase in recorded giving to most regional churches from last year to this year is largely because offerings now go only to regional churches, not to MC Canada. 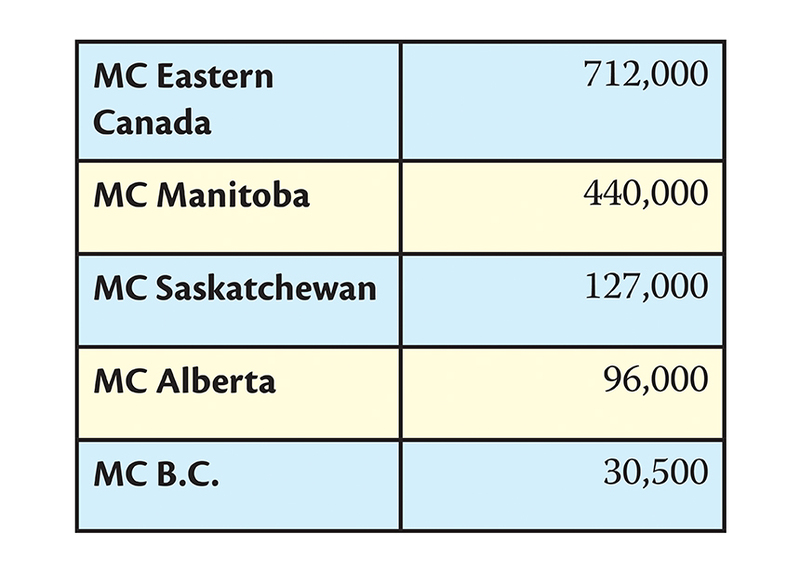 That means that projected giving to regional churches for 2018 includes amounts that would have gone directly to MC Canada in the past. Each regional church will forward a set amount to MC Canada from the offerings received. Some designated giving to MC Canada for its Witness programs is still expected. MC Eastern Canada is an exception. 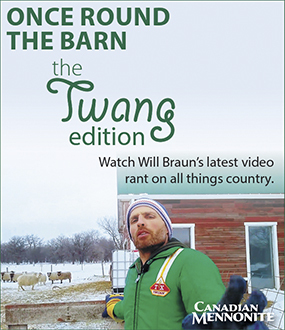 It has long forwarded offerings to MC Canada through its books. For the sake of consistency in the chart, those offerings are recorded as going to MC Canada, not MC Eastern Canada, in years prior to 2018. MC Eastern Canada is an exception more broadly as well. Its financial situation is relatively robust. And since it already accepts offerings for MC Canada, the Future Directions shake-up changes relatively little for it. On the national front, last year MC Canada set the goal of trimming its budget to $1.9 million for the current fiscal year. Income would come from the five regional churches ($1.5 million), designated Witness giving, and “self-generated” income. In May, the Joint Council approved a slightly higher $2.1 million budget for the current fiscal year, even though projected income from regional churches has dropped slightly since the $1.5 million estimate last fall. Joint Council hopes to be closer to the $1.9-million overall budget goal next year. All of this requires one more big caveat: Money is not the measure of a church’s health, but it is one fairly accurate indicator of its priorities. Other measures of church health might be church attendance, volunteer hours, meals delivered to those in need, number of hugs, volume of congregational singing, culinary quality of potlucks, demographic mix in the pews and engagement with marginal groups, among others. Even all of that would not get at the wonderfully intangible essence of church. Church is not about numbers. But hopefully these numbers provide a useful lens through which to consider the bigger picture. Thank you for a helpful synopsis. What would be helpful now would be some comparison to other similar/like communions and an assessment from them as to why they have experienced decline. Also, do we have fewer congregational adherents that are being asked to shoulder a larger burden? And where do the favourite charities of Mennonite Church congregational members fit into this picture--charities like CMU/CGC/MDS/MCC/MEDA? With a clearer picture, we might be able to discern a path forward?